High quality desk embosser. The desk embosser provides more leverage and support which means less strain on your hands. Imprint size is approximately 1 5/8" square. Typestyle and positioning only.. When you are ready to put a personal touch onto your Christmas gifts and correspondence, our hand held embossers make a great choice. These embossers use the pressure of your hand with an ergonomically designed handle to imprint a personalized image onto your note cards, stationery and holiday greeting cards. 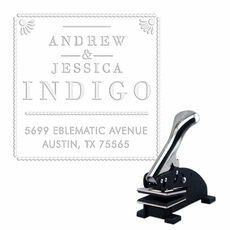 Our embossers come in classic designs from monograms to family names to couple's names, initials, and great designs. From nautical to holiday, you can find just the perfect accent for your embossing look. If you need a hardworking, heavy-duty embosser, try our desk embosser. 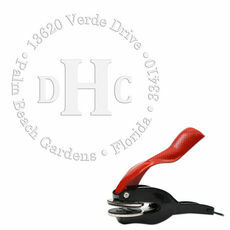 This style of embosser gives you more leverage so that you can use it hundreds of times without even noticing. 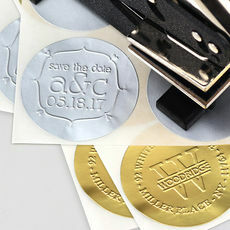 For a classic style of embosser, try out our block monogram or filigree styles. These embossers create round designs or square designs and are easy to operate. Our script monogram and toile embossers are also traditionally styled and can accommodate a single person or family's name along with the mailing address. An equally charming style is our graphic snowflake design, which offers a large central snowflake that is surrounded by your personalized text in uppercase letters. During the holiday season, try out our holiday embossers. These are available in Christmas, New Year's and season's greetings designs. Choose from snowflakes, holiday wreaths and other winter scenes. Easy to use, great quality, fantastic pricing and great durability, you will certainly enjoy your new embosser for years.